Dublin-born Patrick Swift settled in London in 1950 where he was associated with a group of writers and artists in Soho which included Francis Bacon, Lucien Freud, George Barker and Patrick Kavanagh. Predominantly a painter of portraits and landscape, Swift attacked abstract art through the magazine ‘X’ under the pseudonym, ‘James Mahon’. In 1962 he left England for Portugal where he founded the Porches Pottery. Little known in Ireland due to his distrust of celebrity and dislike of exhibitions, he produced a significant body of paintings and works on paper during his lifetime. 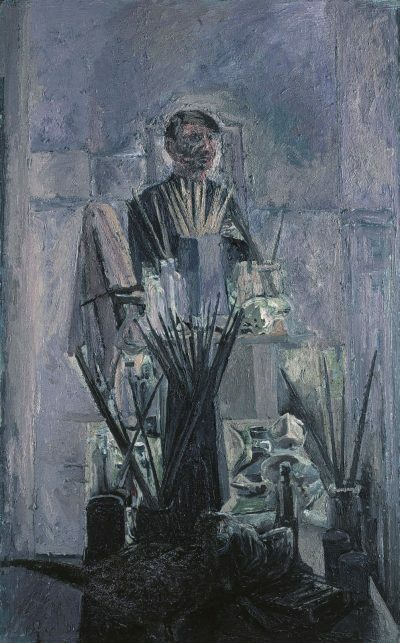 This portrait, one of several self-portraits, depicts the artist surrounded by the tools of his trade. He looks out at us warily as if to say that his art is ultimately of greater importance and interest than the artist who produced it.